Oyster mushrooms are easy to propagate on the home scale using cardboard, so I spent quite a few years pushing oysters. But the truth is that, while Mark thinks oyster mushrooms are good, he thinks shiitakes are great. Unfortunately, shiitake mushroom spawn is less malleable than oysters and won't thrive on cardboard. Enter the mini-mushroom-log propagation experiment! I call it an experiment, but the truth is that Tradd Cotter lists this as a viable technique in his book. 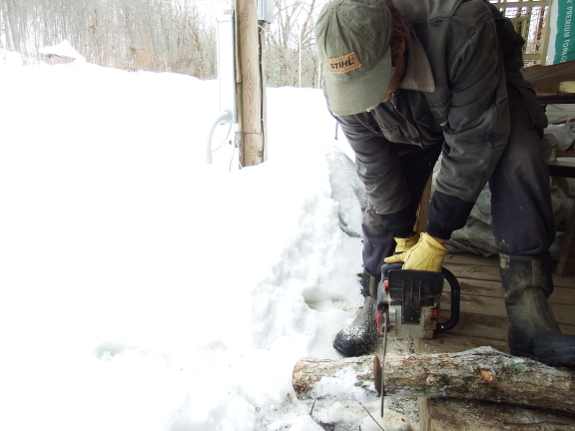 Granted, he uses logs that are much larger in diameter than the little rounds I had Mark cut up and drill for me to plug Monday. But I'm hoping that as long as I keep them moist, logs 8 inches long and 3.5 inches in diameter will be sufficient for getting the shiitake mycelium running. Eventually, we can stack multiple rounds together, allow the mycelium to fuse, and thus have enough fungal body to produce a good mushroom flush. The other thing I'm adding to give this experiment my own personal twist is to bag each log loosely and let the spawn run through the logs at room temperature. This is pure winter-doldrums thinking on my part --- I want something to play with now! 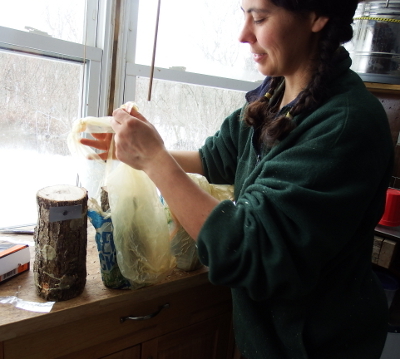 Once I start seeing mycelium on the ends of the logs, I'll put a piece of wet cardboard on top of each log and a fresh, unplugged log above that. Tradd promises that the original spawn will pass through the cardboard and into the new wood, expanding my planting without buying new plugs. 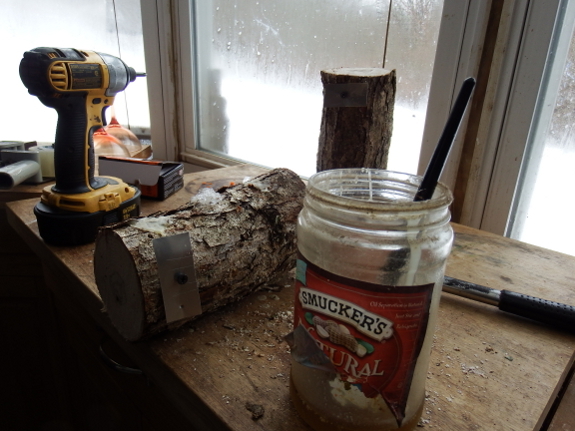 Total cost for this experiment: $3 worth of plugs, plus a bit of electricity to run the chainsaw and drill. I can only peer at my seedlings so many times a day, so having three mushroom logs to pore over while the ground is snow covered is worth the price of admission already.